You guys! We are almost done! The guys working on our house said they may be done with our kitchen and downstairs bathroom as early as tomorrow!! Like, officially D-O-N-E. The thing about being “done,” though, is that there’s still a lot for us to do. 1. Paint. We really need to paint. We’re thinking of a light warm grey for the majority of the walls, all-white trim, and then black chalkboard paint for the one big wall. We like the idea of keeping this room neutral — the opposite of the retro mint green walls and checkerboard floor we used to have. That was fun, but we want to sophisticate-up this room (is that a thing? you know what I mean). In addition to the kitchen, we need to repaint the pantry and also the hallway that connects the kitchen to the newly renovated downstairs bathroom. Currently that hallway is bright yellow with black trim (a little unplanned homage to the bumblebee). We’re going to paint the trim white and the walls to match the kitchen. That’s A LOT of painting. That will probably be my first project after Christmas. 2. Curtains. 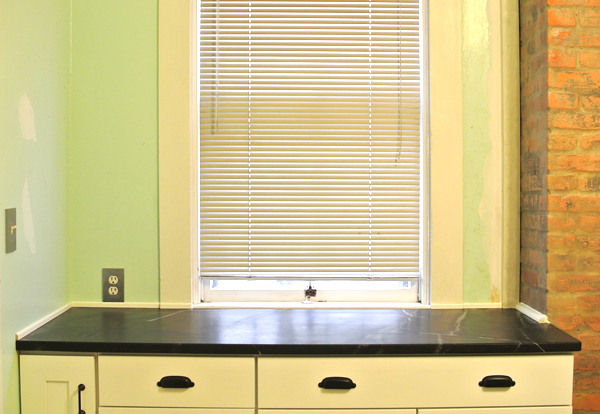 We need to get rid of these gross old metal mini blinds. I really think these things are my mortal enemy. I will be SO happy to take them down and put up curtains. 3. Open shelves. One of the things we always knew we wanted in our kitchen is open shelves. We debated about where and how many open shelves to have, and decided to put up a few wood shelves to the right of the chimney. I love the idea of mixing materials — black natural stone counters, painted white cabinets, brick chimney, and warm wood shelves — so I think the shelves are going to be a really fun addition to the room. It’ll also be nice to have a place to display some of my favorite pretty things. 4. The pantry. Well, obviously it needs a lot of work! All of that stuff in there now is the contractors’ so that will get cleaned out this afternoon. 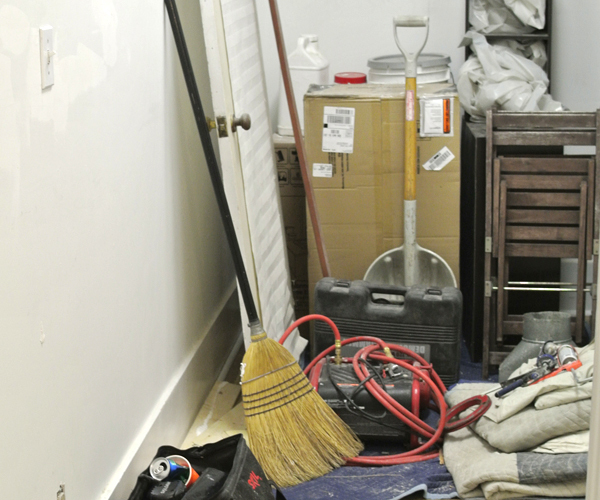 Once the pantry is painted, we want to make it totally functional and organized, with places for everything. We’re going to start with a couple of Ikea Billy bookcases and build on from there, as needed. We want to take advantage of how much storage space we have in this room and maybe build up, perhaps one day putting in one of those awesome library ladders that is on a track. Also, one of our contractors recently suggested that we should move our washer and dryer from the basement into the pantry. Mind.Blown. Ahhhh! I had no idea this was even possible! They like to tell me, “anything is possible!” I seriously thought we were stuck lugging our baskets into the basement forever. We aren’t ready to commit to another big project right now, but in a year or two, we definitely want to look into it. Or maybe I’ll get so mad at laundry in like two weeks we might just go for it now, haha. So, in some ways, now that our contractors are done in the kitchen, our work is just beginning… And that’s just that room! We still have to lay down the upstairs bathroom floor and put beadboard on the walls, before the guys come back to install our clawfoot tub in a month or two. Phew. I need a nap just thinking about all of these projects! But, seriously, this is the fun part, where we can get our hands a little dirty and really put our own stamp on this house. It’s going to look so much better and feel so much more like home as we check off each thing on our to-do list. 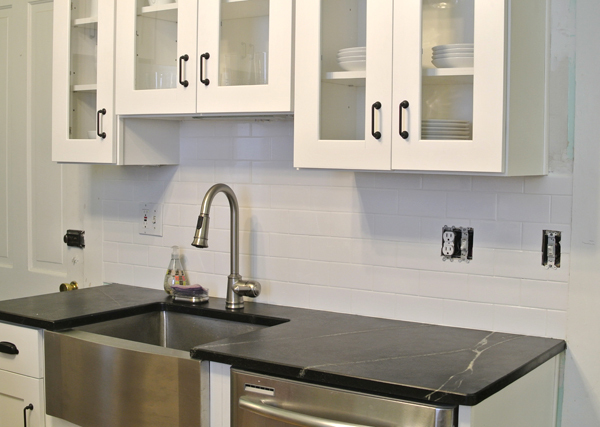 Gray walls, black accent wall, white cabinets, stainless appliances….this feels familiar? I know. I’ve totally thought of that. I guess there’s a reason we get along so well!! Congratulations, that must be such a great feeling to be done!! Thanks Laurel! It’s really exciting. Yay!! 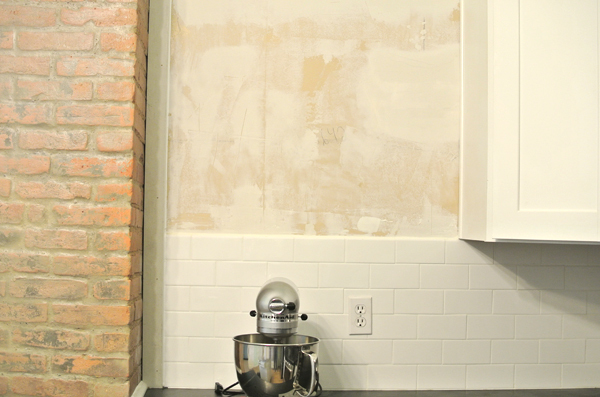 I LOVE the exposed brick, and the counter top looks amazing.